Sorry it’s been so long since the last update, but one of the reasons I’ve not been updating my blog the way I should is because I’ve been trying to get two businesses started as a vendor. I am currently a vendor at the Foley Farmer’s Market in Foley, Alabama. I have a baking stand as well as a photography stand, so this has kept me very busy. I also became a Christian and have been spending a lot of time at church, so, not a lot of time left over for blogging. I figure if I post one recipe every week or so, that’s not too bad, but hopefully I’ll be able to post more. Anyway, here are a few assorted photos from my shows. Most of what I bake is quick breads, but I also make other things that change each week. Thank you to those who continue to follow me! Every time we visited Lancaster County, Pennsylvania, we would go to the “Green Dragon” flea market. 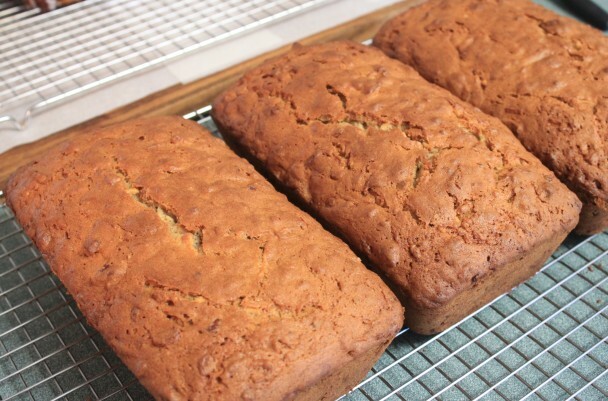 I would always look forward to going to a particular Amish stand to buy their Amish Apple Bread! I love this bread so much I had to find a recipe that was as close to their bread as I could get. Right now I’m unable to remember where I found this recipe, but it could have been from one of the Amish cookbooks I have, I’ll take a look later. I have been so busy at the farmer’s market I’ve not had time to post recipes, so I’m taking this time to post a few, I don’t want to take time looking through cookbooks right now to find which book I found this recipe in! lol Anyway, this bread is as close to the Amish as I could find. I love this bread and it’s especially yummy warmed in the microwave and a little (or a lot) of butter on top! I hope you enjoy this bread as I have. This bread is also among one of my best sellers at the farmer’s market. Combine and set aside oil, eggs, sugar and vanilla. Sift together flour, cinnamon, baking soda and salt. Add dry ingredients to oil mixture gradually. Add apples and nuts (optional). Bake in 2 regular loaf pans or 3 foil loaf pans for 1 hour and 30 minutes. Bake time depends on your oven. Some bake earlier and some bake later, just test with a toothpick inserted in center. If toothpick comes out wet bake longer; tooth pick should come out clean. Cool bread in the pan for 10 minutes and sprinkle with sugar. *I grease loaf pans with vegetable shortening and coat with mixture of ½ cup sugar mixed with 2 teaspoons cinnamon. I coat pans with the mixture and once batter is in pans, I sprinkle the cinnamon sugar mixture on top. This is optional. This bread is one of the most requested breads I make. When I worked at the Navy hospital (now retired), this was their favorite bread and one of the most requested. Now that I’m a vendor at a farmer’s market in Foley, Alabama, it’s become one of the most popular breads sold. No matter where I take it, everyone raves about this bread. The only people who do not rave about it is those who do not like raisins or nuts. You can always make this bread with chocolate chips or what ever you prefer to add or omit. This bread is actually easy to make, but it’s a 10 day process. Most people do not know that you can freeze the batter once it’s at the baking point of day 10. Make sure on day 10 you add the required ingredients BEFORE separating out into zip locks. Once the batter is frozen in your freezer, it does not freeze hard, it becomes like rubber and is bendable. Once you are ready to make your bread, lay it on the counter to thaw or place in water, it does not take that long to thaw. I hope you enjoy this bread as much as I do! Mix all starter ingredients well and place in a gallon-size freezer zip lock. Each day squeeze the bag until day 5. Day five is when you add additional ingredients. Make sure you have 1 gallon size zip lock for each starter you want to make. Remember, on day 10 each bag divides out to 4 people, one for you and 3 other bags for friends. Never use metal utensils or mixing bowl for mixing Amish starter. This is the day you receive the batter (do nothing) Or make the batter. To the bag add 1 cup milk, 1 cup sugar and 1 cup all-purpose flour and then squeeze the bag. Do not worry about getting out all the flour lumps, they will dissolve and mix in the batter by itself. Combine in a large bowl, the batter, 1 cup flour, 1 cup sugar and 1 cup milk. Mix with a wooden spoon or spatula (do not use any metal spoons or bowls). Once mixed together, pour 1 cup each of batter in 4 large zip locks. Keep 1 for yourself and give 3 away to friends along with recipe instructions. Preheat oven to 325 F. Grease 2 (2-pound) loaf pans. 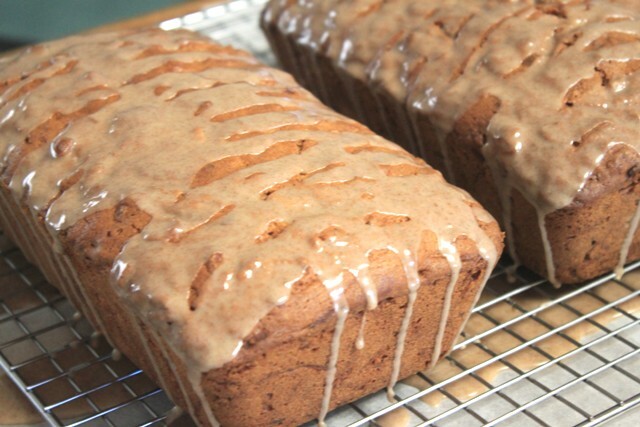 Mix together ½ cup sugar and 2 teaspoons cinnamon well and coat loaf pans well with the sugar mixture. Any leftover sugar cinnamon mixture, sprinkle on top of batter before baking. *Once batter has been mixed well, you can add whatever you want to the batter before pouring into pans. Examples follow. Pour batter into pans and sprinkle with sugar cinnamon mixture. Bake at 325 F for 1 hour. If a toothpick inserted in center of bread does not come out clean after one hour, bake longer until toothpick inserted in center of bread comes out clean. Let bread cool in pans before removing. *Optional: Add 1 and ½ cups of the following: chopped pecans, raisins, chocolate chips, coconut flakes or whatever else you prefer. I always add pecans and raisins but use what you prefer. If you’re a fan of pumpkin spices you should love this cake, especially when fall weather is here. I love the way this cake smells when it’s baking in the oven. Your entire house will smell of pumpkin spice and we all know how wonderful that smells. This cake is from a magazine I bought in 2006 called “Nestle Very Best Baking.” As soon as I saw this cake I had to write it down so I would be sure to make it. I was not disappointed in how it turned out and it’s not too hard to make. I hope you enjoy this cake as much as I do. 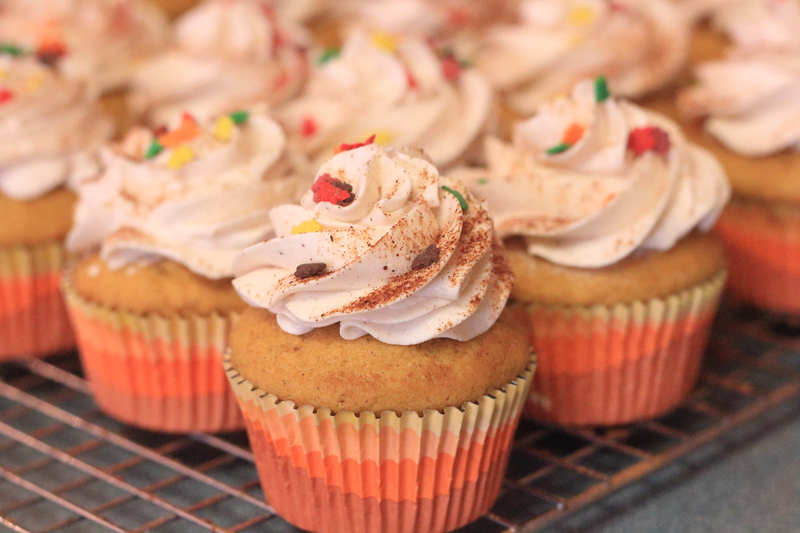 I use this cake recipe for cupcakes also and they turn out just as moist and just as delicious. Preheat oven to 325 F. Grease and flour 2 (9-inch) round baking pans. Combine flour, baking powder, pumpkin pie spice, baking soda, nutmeg and salt in a small bowl. Beat sugar and butter in a large bowl until creamy. Add eggs and beat for 2 minutes. Beat in pumpkin, evaporated milk, water and vanilla. Gradually beat in flour mixture and spread evenly into prepared pans. Bake 35 to 40 minutes or until a toothpick inserted in the center comes out clean. Cool in pans for 15 minutes before inverting onto wire racks and then cool completely. To Assemble: Cut each cake layer in half horizontally with a long serrated knife. Frost between layers and on top of cake, leaving sides unfrosted. Garnish with walnuts of desired. *I did not cut layers in half, I left layers as they were and iced between the two layers and I iced the outside of the cake. 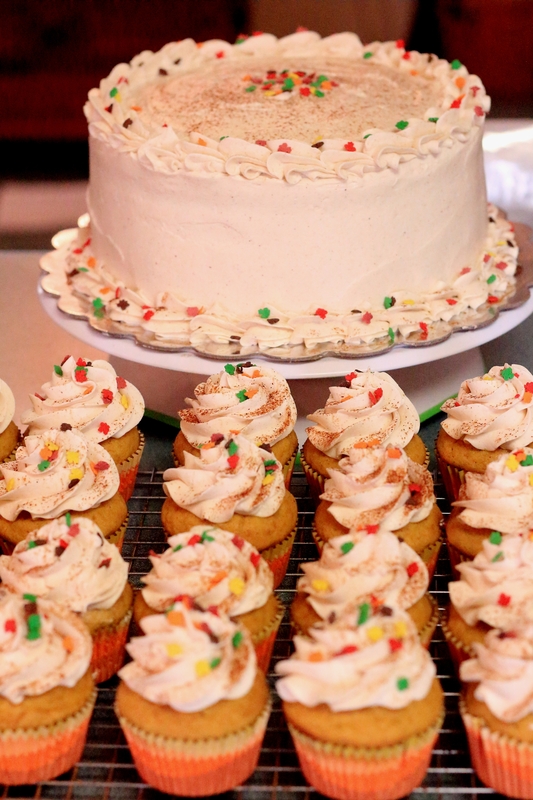 **Cupcakes will not take as long to back and it makes about 28 to 30 cupcakes. I baked them for about 16 minutes…check cupcakes every so often in the final minutes so you will know how long your oven takes for them to bake. Combine confectioner sugar and butter in medium size bowl. Stir in 2 Tablespoons heavy cream. If desired, add 1/2 teaspoon almond extract or vanilla. Beat until smooth and creamy, add more cream 1 Tablespoon at a time if necessary, or add more confectioner sugar if you prefer your icing to be thicker. This bread is from a cookbook I bought while visiting family in Pennsylvania. I was at an auction siting next to a Mennonite lady during the auction. We began talking about various things when we suddenly realized we both had a love for baking. I asked her what was her most favorite “go to” cookbook and she told me about her favorite cookbook called “The Basics and More Cookbook.” She told me I might find this cookbook at a local Mennonite store. As soon as the auction was over I had to find this store! When I got to the store, I began looking in the cookbook section and there it was… on a bottom shelf…my new “go to” cookbook! lol I have made quite a few recipes from this cookbook, but most of the time I go to the BAKING SECTION! I love the smell of bread while it’s baking, and it doesn’t matter what kind of bread, regular bread or sweet breads! I love the smell of yeast breads, but there are so many breads that do not require yeast that are just as awesome…but, yeast breads will always be my favorite. Even though this bread does not require yeast, it’s still a very good bread; although I thought this recipe was a little on the dry side, but, the next time I make it I would probably add some sour cream to it, or an extra egg. I don’t want to discourage you from making this bread, it may not even be on the dry side to someone else. So. why post this recipe instead of it’s a little on the dry side? I still think it’s a good bread! lol It’s great warmed up with butter on top! You can taste the cinnamon along with the apples and then the crunch of the nuts….oh, still yummy indeed! This bread recipe did not call for icing drizzled on top, so this is your option of you prefer the additional sweetness the drizzle icing adds to the bread. Cream sugar and shortening. Beat in eggs. Add apples. Mix dry ingredients and add. Stir in nuts. Pour into a greased loaf pan. Bake at 350F approximately 1 hour. Do not slice until cool. *Optional : This bread did not have an icing, but I like a little icing drizzled on top. Just mix some powdered sugar with a little water until you have the desired thickness you want. I also added a teaspoon of cinnamon to the icing, but his is also optional.